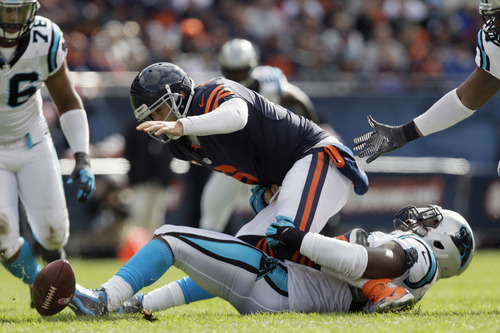 Chicago • Jay Cutler took a beating in the first half and came back to lead the Chicago Bears to a last-second victory. The Bears trailed 19-7 in the fourth when the game turned in a big way. 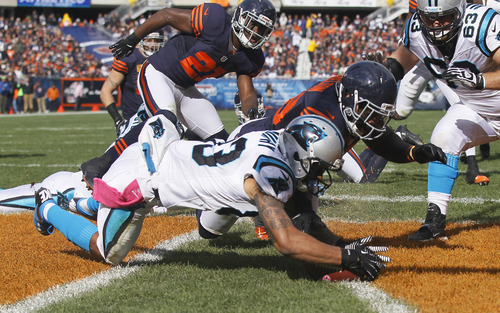 Chicago (6-1) took over on the Carolina 38 after Brad Nortman shanked a 6-yard punt, and Cutler connected with Kellen Davis on a 12-yard scoring pass with just under seven minutes left. Then on Carolina's next play from scrimmage, Steve Smith slipped on a pass pattern and Tim Jennings returned his second interception of the game 25 yards to make it 20-19. Cam Newton then drove the Panthers to the Chicago 27, and Justin Medlock's 45-yard field goal hit the right upright and went through to put Carolina ahead 22-20 with 2:27 remaining. Medlock finished with five field goals. Cutler moved the Bears 55 yards to the 23-yard line before Gould nailed his game-winner. It was another tough loss for Newton and the Panthers, who fell to 1-6 and lost their fifth straight game. The Bears pulled this win out even though Carolina ran up 416 yards and sacked Cutler six times, with Greg Hardy getting to him three times. Brandon Marshall had 98 yards receiving and Matt Forte ran for 70 yards and a touchdown for Chicago. Newton threw for 314 yards and Steve Smith added 118 receiving for Carolina, but the Panthers suffered another stinging loss after firing their general manager. With the worst record in the NFC, they fired longtime general manager Marty Hurney on Monday while making it clear no one except maybe Newton is safe. Even he's come under criticism in recent weeks for his demeanor, and adding to the Panthers' woes was a mounting list of injuries, with three-time Pro Bowl center Ryan Kalil (foot), cornerback Chris Gamble (shoulder) and three-time Pro Bowl linebacker Jon Beason (knee and shoulder) going down for the rest of the season in recent weeks. None of that seemed to matter for much of the day. Cutler tried to hit Marshall deep in double coverage on Chicago's first possession and got picked off by Josh Norman near the goal line, an ominous start for the Bears. Forte's 13-yard scoring run through a big hole in the line on the Bears' next possession made it 7-0. Newton responded by hitting a wide open Brandon LaFell on a slant for a 62-yard gain, putting the ball on the Chicago 18, but the Panthers settled for a field goal by Medlock. They had another golden opportunity late in the quarter after Cutler got sacked on consecutive plays, with Charles Johnson stripping him and Frank Alexander recovering at the Chicago 16, and converted this chance. Newton fumbled the ball into the end zone after an 8-yard scramble, but Louis Murphy made the recovery to give Carolina a 10-7 lead early in the second quarter. Medlock made it a six-point game with a 31-yard field goal with 4:36 left in the half, and the Panthers were threatening to score in the final minute of the half when Peppers wrapped up Newton as he dropped back with the ball on the 40. Chi • Forte 13 run (Gould kick), 4:32. Car • FG Medlock 34, 2:01. Car • Murphy fumble recovery in end zone (Medlock kick), 14:45. Car • FG Medlock 31, 4:36. Car • FG Medlock 22, 6:47. Car • FG Medlock 43, 1:30. Chi • Davis 12 pass from Cutler (Gould kick), 6:52. Chi • Jennings 25 interception return (pass failed), 6:44. Car • FG Medlock 45, 2:27. Chi • FG Gould 41, :00. 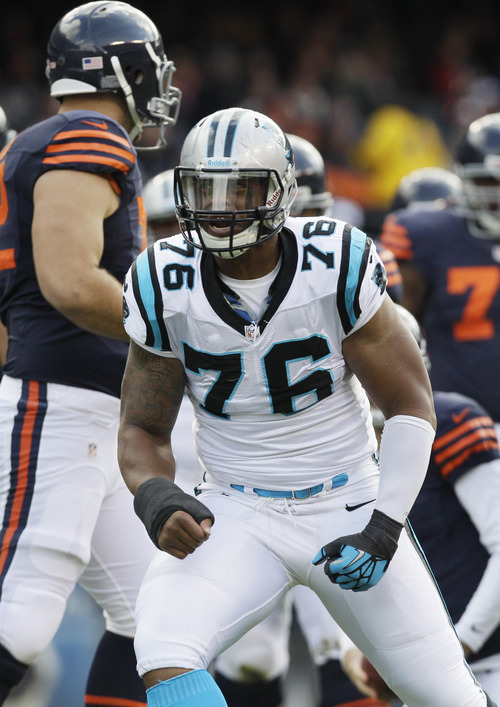 Rushing • Carolina, Stewart 17-42, Newton 5-37, D.Williams 11-33, Tolbert 3-7. 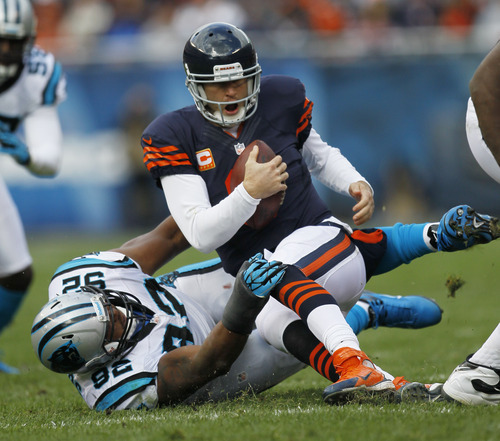 Chicago, Forte 15-70, Bush 3-5, Cutler 1-4. Passing • Carolina, Newton 20-39-2-314. Chicago, Cutler 19-28-1-186. Receiving • Carolina, Smith 7-118, Stewart 4-38, LaFell 3-88, Olsen 3-23, Hartsock 1-25, Tolbert 1-15, Barnidge 1-7. Chicago, Marshall 9-98, Forte 5-24, Bennett 3-47, Davis 1-12, Hester 1-5. Missed Field Goals • Chicago, Gould 33 (WR).